I am drafting. I like to write a first draft without going back to revise anything until the whole thing is on the screen. Get the story out kinda deal. Well, it was my turn in my online writers group…The Walrus Writers, yes the name means something, but if I tell you I’ll have to kill you. So…yeah. Anyway, I decided to send them my first chapter…and I did a bit of revising, because PANIC OMG I CAN’T SEND THEM THIS! happened in my head. But really, there was nothing I could do to make it fabulous…it’s THE BEGINNING. Maybe I started it in the wrong place…maybe I left out some important information *cough*character’s age*cough*…maybe I should have added a couple scenes. I DON’T KNOW! But everyone’s comments made me think about all of that and more. But I am drafting. So no going back right now. I’m going to let my creative brain sit on all the thoughts and maybe when I go back, I’ll have an idea. But let’s be honest. Beginnings are the spawn of the Devil. They are evil. I hate them. I think I know where the story starts, then I QUESTION EVERY THING! I think I know my main character, then they change as I write the story. So evil beginning, we will meet again. After I finish the draft. After I think on what I learned from the story. After I let all the thoughts marinate in my brain. Will I ever start the story in the right place? IS THERE EVEN A RIGHT PLACE? Will I ever get all the information I need into a beginning on the first try? Will I ever not hate beginnings? Nope to all the questions. Because that’s how the writing process goes. The manuscript grows and changes. It evolves. Then I can go back and make the beginning better, so it can set up the story the best way possible. Maybe after one…or 75684948595 rewrites. Who knows? I’m not going to fight it. I’m not going to sweat it. That’s how it is. Beginnings will always be evil. but really I feared it WOULD be good enough. The world of reaching your dreams is scary. Well, I admitted it. I talked about it. I looked the fear in the eye. And the sucker stole my cookies and ran. But I can always get more cookies. Fear isn’t real. We give it power. We can take that power away. Fear is this dark, smokey, formless thing, drifting through our minds and nibbling at our souls. Until we name it. Until we admit what scares us, then it takes form. Becomes solid and we can see it when we punch it in the face. So I went back to writing and have added words! Soon I will have a first draft…well, maybe not soon soon, but soon. Never be afraid of what you can do. Never be afraid to go where it’s scary. Never be afraid to look at your fears and give that bully a piece of your mind. Like all bullies it will run…and maybe take a few cookies just to get back at you. If you want me…I’ll be on my couch watching and trying to write. Growing up, my mom always made a big deal of the Olympics. People from countries all over the world come together to compete peacefully, to do their best whether that means fame and medals or just being there, able to share the sport they love. Countries with one athlete. Countries with ten…fifty…or hundreds of athletes. So many languages. So many cultures, religions, and stories. Together. Smiling. Cheering. Everyone speaks the language of a high-five or a hug. Years of training, of hard work, of giving up so much to get to one moment. At the bottom of the snow-covered hill, the end of the sled track of ice, the finish line, no matter the flag by the name, no matter the color of the uniform, no matter the language spoken, everyone is cheering. Do we want our athletes to win? Sure. Do we still smile and maybe cry happy tears for the winner if they aren’t from our country? You bet. This is how the world should be. Everyone together. Everyone cheering. Everyone pushing others to do their best and celebrating the best they can do. Peaceful competition. For those who have tried to cheat, to hurt, to ruin this celebration in the past…you lose. Every time. Because the feeling of the Olympics, the togetherness is stronger. Many more will cheer. Many more will give a smile or a hug. Many more will continue to work to make the world better. The song Imagine was played at these opening ceremonies…I dare you not to cry. The opening ceremony pulses with hope of moments to come, with all that is possible. The closing ceremony sighs with memories made, with hills and ice conquered, with routines skated, with friends made, and dreams lived. Maybe a medal, maybe not. Maybe all that was important was to be at the Olympics. So I will watch as the world comes together. I will smile for those who win and cry for those who fall. But more importantly…GO WORLD! Look how well we can live together. Look how great we can be. Imagine no borders. No countries. Just humanity. Just people. Just being the best we can be. Thank an Editor Day is Today! They take our words, those piles of thoughts and descriptions, and help us form them into the best story it can be. From grammar to word choices to story development, from cutting scenes to adding scenes, editors push writers to dig deep, to make sure our characters grow, to make sure our story is told in the best possible way. Those gifted individuals inspect every word, delve into the story line and rearrange scenes, take a scalpel to our manuscripts and help us put them back together. Without editors writers would be lost. 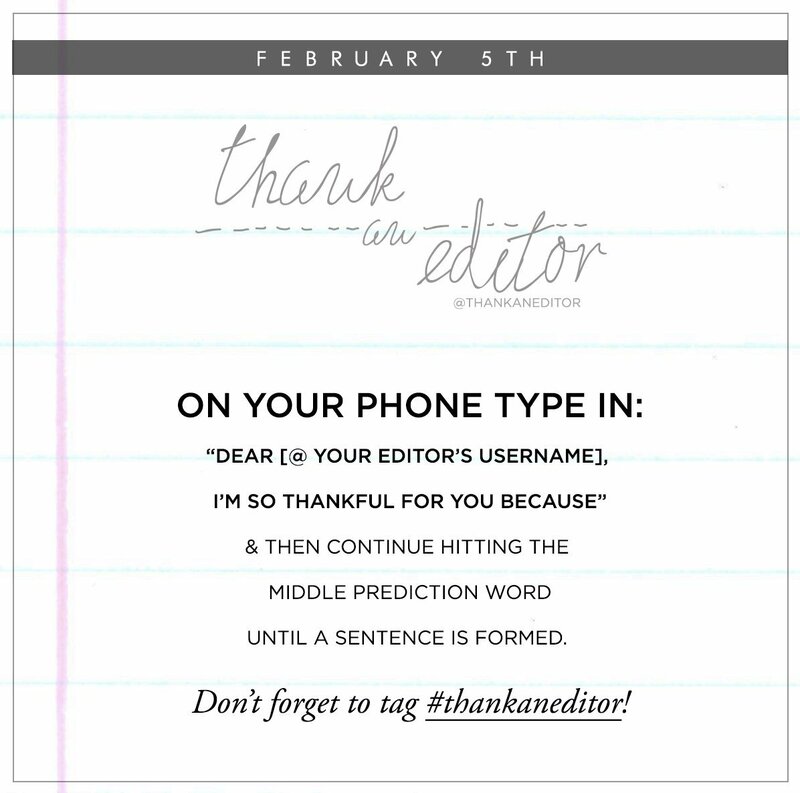 Jump on Twitter today and #thankaneditor. They do so much work and deserve thanks. Here’s a fun way to do it! I’ve worked with a few editors. I have enjoyed it every time. We become a team, working together, passing ideas back and forth, and celebrating when we get it right. Rarely do these fabulous people get praise or acknowledgement. Editors have a huge role in the journey of the creation of a book. These talented word whisperers are a gigantic support to authors. Have a wonderful wordy day.